The Events Priority in the nMPRA and Consumption of Resources Analysis on the FPGA, CIOBANU, E.-E. High-Level Crosstalk Model in N-Coupled Through-Silicon Vias (TSVs), LEE, H., PARK, J. K., KIM, J. T.
Efficient Shape Classification using Zernike Moments and Geometrical Features on MPEG-7 Dataset, ABBAS, S., FARHAN, S., FAHIEM, M. A., TAUSEEF, H.
In a random deployment, sensor nodes are scattered randomly in the sensing field. Hence, the coverage can not be guaranteed. In contrast, the coverage of uniformly deployment is in general larger than the random deployment. However, uniformly deployment strategy may cause unbalanced traffic pattern in wireless sensor networks (WSNs). In this situation, larger load may be imposed to CHs (cluster heads) around the sink. Therefore, CHs close to the sink use up their energy earlier than those farther away from the sink. To overcome this problem, we propose a novel node deployment strategy in the concentric model, namely, Region-based Intelligent Cluster-Head selection and node deployment strategy (called Rich). The coverage, energy consumption and data routing issues are well investigated and taken into consideration in the proposed Rich scheme. The simulation results show that the proposed Rich alleviates the unbalanced traffic pattern significantly, prolongs network lifetime and achieves satisfactory coverage ratio. C. W. Chen and Y. Wang, "Chain-Type Wireless Sensor Network for Monitoring Long Range Infrastructures: Architecture and Protocols," Int. J. of Distrib. Sensor Networks, vol. 4, no. 4, pp. 287-314, Oct. 2008. M. Saleem, I. Ullah and M. Farooq, "BeeSensor: An energy-efficient and scalable routing protocol for wireless sensor networks," Information Sciences, vol. 200, no. 1, pp. 38-56, Jan. 2012. M.S. Familiar, J.F. Martinez, I. Corredor and C.G.-Rubio, "Building service-oriented Smart Infrastructures over Wireless Ad Hoc Sensor Networks: A middleware perspective," Computer Networks, vol. 56, no. 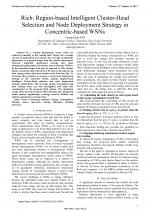 4, pp.1303-1328, Mar. 2012. D. Tian, Z. Lei and N.D. Georganas, "Configuring node status in a two-phase tightly integrated mode for wireless sensor networks," Int. J. of Ad Hoc and Ubiquitous Computing, vol. 2, no.3, pp. 175-185, 2007. N. Essaddi, M. Hamdi, S. Habib and N. Boudriga, "Evolutionary strategies for non-uniform deployment in wireless sensor networks," Int. J. of Communication Networks and Distrib. Systems, vol. 7, no. 3/4, pp. 331-354, May 2011. A. Gorbenko, M. Mornev, V. Popov and A. Sheka, "The problem of sensor placement for triangulation-based localisation," Int. J. of Automation and Control, vol. 5, no. 3, pp. 245-253, Oct. 2011. G. Fan, R. Wang, H. Huang, L. Sun and C. Sha, "Coverage-Guaranteed Sensor Node Deployment Strategies for Wireless Sensor Networks," Sensors, vol. 10, no. 3, pp. 2064-2087, Mar. 2010. S. C. Liu, "A Lifetime-Extending Deployment Strategy for Multi-Hop Wireless Sensor Networks," Proceedings of the 4th Annual Communication Networks and Services Research Conf. (CNSR), pp. 53-60, May 2006. M. Maleki and M. Pedram, "QoM and Lifetime-Constrained Random Deployment of Sensor Networks for Minimum Energy Consumption," The 4th Int. Symposium on Information Processing in Sensor Networks (IPSN), pp. 293-300, Apr. 2005. Y. Xin, T. Guven and M. Shayman, "Relay Deployment and Power Control for Lifetime Elongation in Sensor Networks," Proceedings of the IEEE Int. Conf. on Communications (ICC), pp. 3461-3466, June 2006. Y.R. Tsai, "Sensing Coverage for Randomly Distributed wireless sensor networks in shadowed environments," IEEE Trans. on Vehicular Technology, pp. 556-564, Jan. 2008. G. Chen, S.K. Das and X. Wu, "Avoiding energy holes in wireless sensor networks with nonuniform node distribution," IEEE Trans. on Parallel and Distrib. Systems, vol.19, no.5, pp.710-720, May 2008. D. Wang, B. Xie and D.P. Agrawal, "Coverage and lifetime optimization of wireless sensor networks with Gaussian distribution," IEEE Trans. on Mobile Computing, vol. 7, no. 12, pp. 1444-1458, Dec. 2008. F.A. Aderohunmu, J.D. Deng, and M.K. Purvis, "A Deterministic Energy-efficient Clustering Protocol for Wireless Sensor Networks," Int.l Conf. on Intelligent Sensors, Sensor Networks and Information Processing (ISSNIP), pp. 341-346, Dec. 2011. D. Ganesan, R. Cristescu and B.B. Lozano, "Power Efficient Sensor Placement and Transmission Structure for Data Gathering under Distortion Constraints," ACM Trans. on Sensor Networks, vol. 2, no. 2, pp. 155-181, May 2006. W. K. Lai, C. S. Fan and L. Y. Lin, "Arranging cluster sizes and transmission ranges for wireless sensor networks," Information Sciences, vol. 183, no. 1, pp. 117-131, Jan. 2012. M.R. Senouci, A. Mellouk, L. Oukhellou and A. Aissani, "Uncertainty-Aware Sensor Network Deployment," IEEE Global Telecommunications Conf. (GLOBECOM), pp. 1-5, Dec. 2011. W.R. Heinzelman, A. Chandrakasan and H. Balakrishnan, "An application-specific protocol architecture for wireless microsensor networks," IEEE Trans. on Wireless Communications, vol. 1, no. 4, pp. 660-670, Oct. 2002. 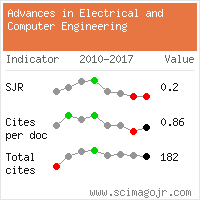 Citations for references updated on 2019-04-24 16:42 in 151 seconds.